The backyard lawn is neatly clipped, the food is prepared to feed, wave after wave of friends coming over, every item on your checklist completed. You are ready for the party of the year, yet wouldn’t you want to kick it up a notch or two? Your party needs a soundtrack – an anthem where all outside factors are drowned out so all of you just drown in the atmosphere of good company and good times. Installing outdoor speakers for your party should be straightforward, right? Not really. 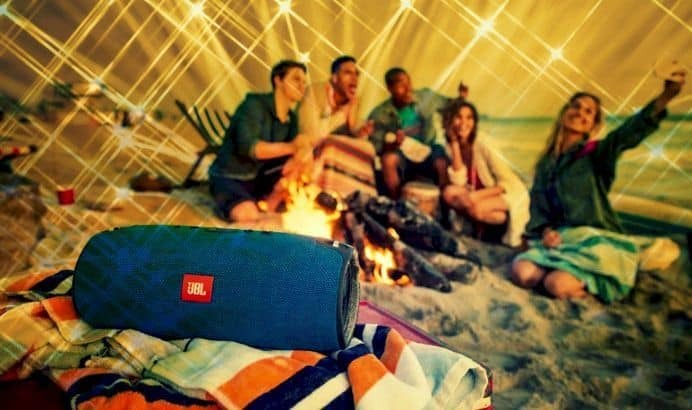 Sure, a big Bluetooth speaker can supply some nice tunes in the air, but somehow, it just doesn’t seem loud enough when you factor in the chatter and laughter of the multitude of people during the party. How about those huge speakers in your living room? They don’t seem durable enough if someone bumps into it or if it rains. You’re going to need something more powerful and one that fits the occasion. Buy “Outdoor” Speakers for your Outdoor Speaker Use! The best advice you can take when buying a new set of outdoor speakers is to resist the urge to buy any cheap plastic/wooden boom box speakers and just set them up outside. One has to expect that throughout the usage and lifespan of your outdoor speakers, they are definitely going to get roughed up. A worst case scenario is that they get caught up in floods and typhoons if you live in areas where those weather conditions are common. The good news is, outdoor speakers are tough and sound pretty good these days. There are even cases where they survive getting submerged in floods or when they got thrashed around by a hurricane. The tank-like construction of a good set of outdoor speakers can be a huge asset and can contribute to a morale boost in cases where you do get caught up in a terrible calamity. We recommend the Definitive technology AW 6500 for its fantastic dynamic range and very rugged design. Other similar products which could deliver around the same kind of performance are the Atrium Series (from Polk Audio) and the RS Series (from Niles Audio). The RS Series’ design makes it look like a rock so it can be placed and positioned in areas where it can seamlessly blend into the surroundings. One last inclusion when you are installing outdoor speakers for your party is a good subwoofer. This is mainly because most if not all of these outdoor speakers lack in the bass department. You can’t really have a party without the bass pumping and thumping for everyone. The Niles Audio GSS10 is a great choice to supplement any of the outdoor speakers mentioned earlier. It is also important to note that there is a difference between weather-resistant and weather-proof. You should be careful when purchasing the former as it may not be as rugged and durable as the latter. Don’t worry though, even if you bought something that is weather-resistant only, you can circumvent its inferior durability with clever placement and positioning. Depending on the type of speakers you have purchased, placement for all of your speakers is key to providing that “surround sound” feel and so that most of the area will be equally covered without one side hogging all of the sound. One great tip is to mount your speakers under the eaves of your house if available. This is especially useful for speakers that may not be as rugged and durable as weather-proof speakers. Mount them underneath so that the eaves offer extra protection and cover during harsh weather conditions. Just don’t place them too high off the ground, around ten feet above ground level would be sufficient. Another tip is to not place the speakers too far apart. This can lead to only hearing one side blasting one side of the surround-sound and the other side doing another side of the music you are playing. Place speakers around ten feet apart so that on any side, people can hear all of the speakers clearly. Larger yards may have more difficulty achieving that surround-sound effect as it may require more speakers. You can assign “zones” or pockets of the large area to have their own dome of surround-sound music. Once you have your speaker placements figured out, connect them with the right kind of wiring. In-wall cables with CL2 or CL3 ratings are necessary. Simply put, CL2 and CL3 ratings mean that they are safe to use outdoors. Normally, stereo speakers require four-conductor cables to work as these cables have wires that allow for left and right channel inputs. For shorter lengths, get the 16-gauge variant while opting for the 14-gauge variants for longer runs of the cables. Like any wiring system, protecting them is also necessary. The usual precautions may be observed like covering the exposed ones and making sure they are out of the way. Burying them, for example is neat way of running those cables around the area. Just be sure to protect them with some hard plastic tubing as conduits so that they are protected from accidental hits from shoveling and the like. Most of outdoor speakers are run with indoor receivers, however, these are not enough in managing multiple pairs of speakers. You can circumvent this problem with multi-channel amplifiers. They can boost the power of your speakers while giving you separate volume control for each area or for each speaker. Try using outdoor volume control boxes especially with multi-channel amplifiers. They are easily mounted on walls and are very handy especially if you are using “zones” for covering large areas. Installing outdoor speakers for your party may require as much preparation and planning as the party itself, but they are worth spending for. Hosting these kinds of parties will surely be something that you can look forward to even more once you have these systems set up. As with most installations of any electronic products, due diligence in research and planning ahead will save you a lot of trouble down the road. But once you get it done, you can happily blast away for everyone to enjoy. Just make sure you don’t disturb the neighbors though!